I love that each of these centerpieces incorporate inexpensive components, but still manage to look chic. To keep a tight budget under control, while decorating a long holiday table, opt for red carnations instead of roses or tulips. 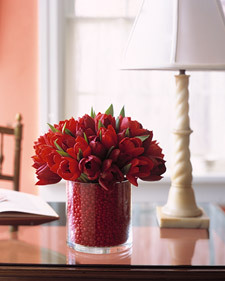 When bunched and in abundance, carnations look just as lush and luxurious as any other snooty flower. If you ask me, they've really gotten a bad rep because of all those high school prom corsages. 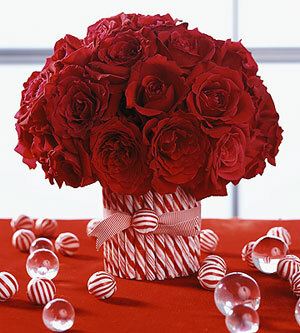 Skip the baby's breath and ribbon and let carnations shine on their own. Lovely ideas! I love the one with the lollipops!